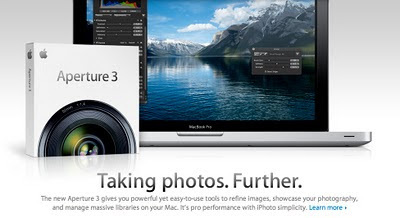 Apple have just launched Aperture 3, the latest version of their image management and editing suite. Back when it came out in 2006, Aperture was the first all-in-one photo management suite, including an image library, a RAW converter and web and print output options. It seems hard to remember back then, but prior to the release of Aperture, digital photographers were having to use a whole suite of apps to manage, develop and edit their photos, such as iView (now Microsoft Expression Media) for cataloguing and keywording, Adobe Camera Raw for RAW conversions, and Photoshop for printing. Although version 1 was flawed in some respects, it clearly showed the way for photographer centric applications, and by Version 1.5 released 6 months later, it was a well rounded application which I began using. Clearly caught on the back foot, Adobe quickly made their beta version of Lightroom publicly available, and released it onto the market a few months after Aperture 1.5. At the time there was little to chose between them, but since then Aperture has seemed to be a bit of a hobby for Apple, while Adobe has gone on to aggressively develop Lightroom including killer features such as localised image adjustments and improved web and print output facilities. These features, along with the sluggish performance of Aperture 1.5, were enough to make me switch over to using Lightroom. However one key area Adobe has not addressed is video. With most DSLRs now capable of shooting HD video, many photographers, myself included, are starting to shoot it more often. As far as Lightroom is concerned, it behaves as if your video files do not exist. While I do not expect to be able to edit video in Lightroom, the fact that it will not even simply copy video files off my memory card when I am importing photos is rather annoying, forcing me to go back to the Finder and drag them over myself. Now Aperture 3 has been released, and not only does it include localised adjustment brushes similar to LR, it also handles video, including import, scrubbing, and combining with stills. For me this is a big deal, and will simplify my workflow enormously. Just as localised adjustment brushes in Adobe Lightroom 2 greatly reduced the number of times I needed to take images into Photoshop, the video features in Aperture 3 should mean my copy of Final Cut Express gets very little use from now on. I was invited to pitch for a job at the end of last year that required stills and video to be combined, and this would have been just the trick. So let's see. I've just downloaded the Aperture 3 trial. I'll report back on my findings here once I've had a good look around over the next few weeks. Installed about 30 hours ago. Still processing the "face detection"... otherwise, I'm pretty impressed.